It was Thanksgiving day in Paris when I got the invite. Tucked into a tiny 2x4 living room were some ex-Pat friends eating a mish mash of traditions including turkey legs from the local bucherie, my mom’s recipe for cornbread and sausage stuffing, a myriad of stinky and sublime French cheese, and a home-smoked trout that was created and cured by our hostess’ father who was visiting from Washington state. He's a farmer and jack of many trades, including catching and smoking fish. Over the course of many plates, glasses and conversations, I received an invitation from him and his wife to come visit and experience the family farm. It took me a year and a half to follow-up on the offer, but it was indeed worth the wait. My friend Stephanie’s father, Steve, is a 4th generation farmer, carrying on the traditions of his father's family and those before him, while blazing a trail of his own. Farming is in his blood. It’s not a job. Farming is his life. It’s a lifestyle. This would be something I’d hear a few times over the week, and would come to know the true meaning of by the end of my trip. When I arrived at the Swannack farm, 40 miles outside of Spokane, Washington, there were 9 people sleeping in the house. That number would fluctuate each day with family members coming and going and friends and neighbors just calling or joining in for a meal and sharing harvest stories. The Swannack family farm sits over 2,600 acres of land between Lamont and St. John. Lamont is the closer and smaller of the two towns, and keeps a running hash mark tally of residents. Right now it’s somewhere around 50 people. Stephanie went to school in St. John, where she graduated high school with her class of 18 people. In the last census, St. John clocked in at 537 people. St. John’s Main Street is without a single stop sign as you roll past a smattering of shops before you’ve reached the other end in a matter of seconds. Everywhere we drove, everyone waved when you passed, even if you weren’t 100% sure who it was. You still had an idea of where they were from or who they were visiting. The scenery is mesmerizing with a sea of gold stretching in all directions. In August, there’s just a few shades of green with an occasional collection of random trees or a plot of grass that I soon learned was planted with intention and purpose. The patches of green, called eyebrows on top of the hills due to their arching shape, are actually nice little money makers. The government has a Conservation program, paying a subsidy to people for planting soil nourishing grass and trees. It takes underperforming, low-revenue producing land out of commission and pays the owners to put more productive soil givers back into the earth. Some farmers who have gone into retirement have even swapped out most of their land for this very cause, receiving the government gift for 10 years, and often getting another 10-year renewal. The government also offers insurance programs to protect against catastrophe, as well as another that safeguards against lower yield or off-pricing seasons. I was a bit surprised to hear of the help that the government provides, thinking they weren’t much of a friend to the farmer. Cattle is another story, but crops like wheat and mustard, big staples for the Swannack’s, can benefit from programs like these. Make no mistake though, you’re not going to see any Bentley’s driving around these parts. Steve is fortunate that his wife has a full time job at the USDA in the Natural Resources Conservation Service department. Her salary helps to cover expenses in slow years, and there are many off seasons where there’s no profit in the fields. What’s often even more important is his wife's health insurance. Turns out people who drive big sharp machines aren’t the insurance company’s favorite people to protect. Harvest had been in full swing for a week when I showed up, with winter wheat being the focus of the large combine’s teeth. Mustards would follow and then the seeding would begin again. 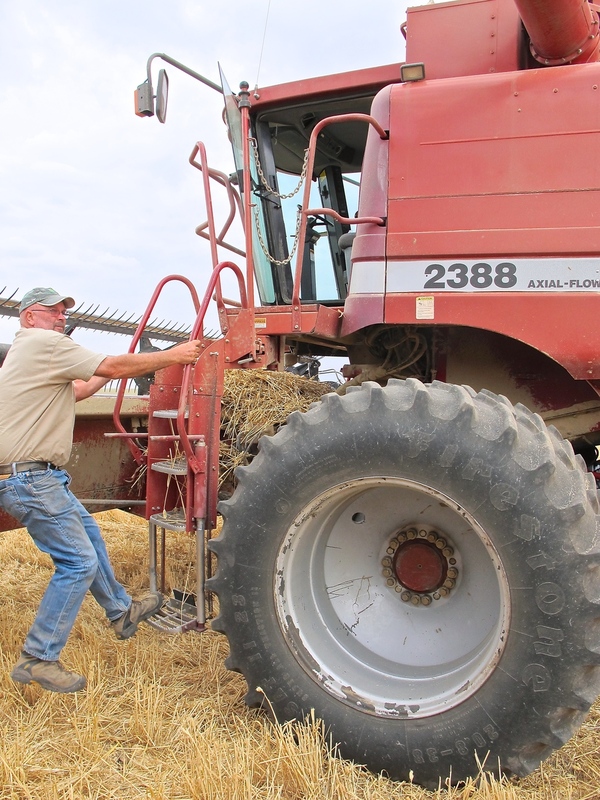 Steve is one of the rare farmers in the area who seeds, practicing no-till farming. This method attempts to disrupt the soil as little as possible, keeping the best nutrients in, as well as reducing the overall carbon footprint used to turn over the land. I saw some of the first hand benefits of no-till farming, and the consequences of those who don’t participate, when a big storm blew into town. Those who turn over their soil a lot have lighter dirt that’s more prone to kicking up at the first sign of a storm. I was out on my first wheat drop to the elevator storage facility in Lamont when the sky took a turn. I had been in the fields with Steve watching the hypnotizing trails the combine cuts when we heard a weather warning on the radio. It talked about 75 mph winds in the area and rainstorms coming through the area for the next 45 minutes. I laughed about how even the weather reports in farming areas can be as wildly off as in the city, pointing to the beautiful blue skies and fluffy white clouds. When the big combine made a 180 turn to the east, the beautiful skies that moments ago were bright blue had instantaneously turned to black. I looked to Steve who continued to cut and fill the waiting trucks. He seemed unphased, so I pretended to be as well. When the last truck was filled to the top, he said, well, we should probably converse with the crew. I snapped pictures while decisions were being made and the sky darkened in all directions. With a newly surging wind, my friend Stephanie reappeared to quickly ask if I’d drive one of the big pick-up trucks back since they were currently down a driver. I laughed, hoping it was a joke, thinking back to the big hurdle I recently overcame when I upgraded myself from a 2 door coupe to a little 4 door hybrid. No time for laughter, I hoisted myself into the big truck, trying to find the gear on the dusty dash, and slowly followed the wheat filled truck out of the fields, across bumpy land with no trails and dwindling visibility. I got the truck safely to the house, but then left the safety of home to accompany Stephanie in the wheat filled vehicle to make the drop in town. When I got into the truck, the wind was whipping at full speed and suddenly we could see nothing in any direction. Visibility zero. We were radioing with her dad, but he told us to press on slowly so we could save the freshly cut wheat. We did as we were told. Not being in a very maneuverable vehicle, we were nervous to move forward as we had seen some vehicles pulled over on the tiny road earlier, but if we stopped, someone could drive right into our enormous mass. When the rain quickly followed the wind, we knew we didn’t have much time since wet wheat is worthless. So we pushed with extreme care and found breaks of sight when we weren’t next to farms with blowing dirt. When we arrived to drop the wheat, the truck was weighed, and then it moved into the “elevator” area, which actually contains no elevator at all. There is, however, some elevation of the truck’s back to release the grain into containers beneath the floor. I wanted to watch and take pictures, which I’m guessing isn’t something they often hear, but the elevator helper shrugged and went and fetched me a mask and sunglasses since he said it can get a bit dusty. My lungs and my camera would soon learn that was the understatement of the year. After the dump and my coughing subsided, the truck was weighed again and the deposited amount was deducted from the original weight and printed out on a receipt for records. It was an adrenaline pumping adventure for me, but it also meant no more cutting that day or the next, until the wheat dried. Even though there's no work in the fields, there’s always work elsewhere. Part 2 continues with tales from the homestead, including the animals, food and daily life at the house. Click here to keep reading.